While stepping (covered in lesson 3.6 -- Using an integrated debugger: Stepping) is useful for examining each individual line of your code in isolation, in a large program, it can take a long time to step through your code to even get to the point where you want to examine in more detail. Fortunately, modern debuggers provide more tools to help us efficiently debug our programs. In this lesson, we’ll look at some of the debugger features that let us more quickly navigate our code. The first useful command is commonly called Run to cursor. This Run to cursor command executes the program until execution reaches the statement selected by your cursor. Then it returns control to you so you can debug starting at that point. This makes for an efficient way to start debugging at a particular point in your code, or if already debugging, to move straight to some place you want to examine further. 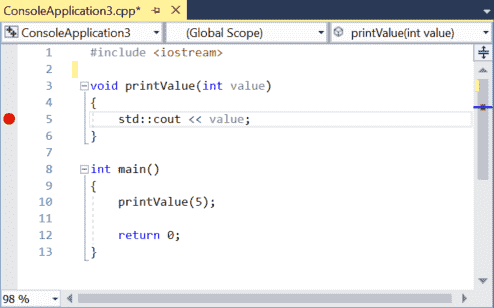 In Visual Studio, the run to cursor command can be accessed by right clicking a statement in your code and choosing Run to Cursor from the context menu, or by pressing the ctrl-F10 keyboard combo. In Code::Blocks, the run to cursor command can be accessed by right clicking a statement in your code and choosing either Run to cursor from the context menu or Debug menu > Run to cursor, or by pressing the F4 shortcut key. Simply right click anywhere on line 5, then choose “Run to cursor”. If you run to cursor to a location that doesn’t execute, run to cursor will simply run your program until termination. Once you’re in the middle of a debugging session, you may want to just run the program from that point forward. The easiest way to do this is to use the continue command. The continue debug command simply continues running the program as per normal, either until the program terminates, or until something triggers control to return back to you again (such as a breakpoint, which we’ll cover later in this lesson). In Visual Studio, the continue command can be accessed while already debugging a program via Debug menu > Continue, or by pressing the F5 shortcut key. In Code::Blocks, the continue command can be accessed while already debugging a program via Debug menu > Start / Continue, or by pressing the F8 shortcut key. Let’s test out the continue command. If your execution marker isn’t already on line 5, run to cursor to line 5. Then choose continue from this point. Your program will finish executing and then terminate. The continue command has a twin brother named start. The start command performs the same action as continue, just starting from the beginning of the program. It can only be invoked when not already in a debug session. In Visual Studio, the start command can be accessed while not debugging a program via Debug menu > Start Debugging, or by pressing the F5 shortcut key. In Code::Blocks, the start command can be accessed while not debugging a program via Debug menu > Start / Continue, or by pressing the F8 shortcut key. If you use the start command on the above sample program, it will run all the way through without interruption. While this may seem unremarkable, that’s only because we haven’t told the debugger to interrupt the program. We’ll put this command to better use in the next section. The last topic we are going to talk about in this section is breakpoints. A breakpoint is a special marker that tells the debugger to stop execution of the program at the breakpoint when running in debug mode. In Visual Studio, you can set or remove a breakpoint via Debug menu > Toggle Breakpoint, or by right clicking on a statement and choosing Toggle Breakpoint from the context menu, or by pressing the F9 shortcut key. In Code::Blocks, you can set or remove a breakpoint via Debug menu > Toggle breakpoint, or by right clicking on a statement and choosing Toggle breakpoint from the context menu, or by pressing the F5 shortcut key. Go ahead and set a breakpoint on the line 5, as shown in the image above. It’s just as if you’d run to cursor to this point. Breakpoints have a couple of advantages over run to cursor. First, a breakpoint will cause the debugger to return control to you every time they are encountered (unlike run to cursor, which only runs to the cursor once each time it is invoked). Second, you can set a breakpoint and it will persist until you remove it, whereas with run to cursor you have to locate the spot you want to run to each time you invoke the command. Note that breakpoints placed on lines that are not in the path of execution will not cause the debugger to halt execution of the code. First, start a new debugging session and then do a run to cursor to line 5. Now choose continue. The program will continue to the end (it won’t stop on line 5 again, even though line 5 is executed twice more). Next, place a breakpoint on line 5, then choose start. The program will stop on line 5. Now choose continue. The program will stop on line 5 a second time. Choose continue again, and it will stop a third time. One more continue, and the program will terminate. You can see that the breakpoint caused the program to stop as many times as that line was executed. There’s one more debugging command that’s used fairly uncommonly, but is still at least worth knowing about, even if you won’t use it very often. The set next statement command allows us to change the point of execution to some other statement (sometimes informally called jumping). This can be used to jump the point of execution forwards and skip some code that would otherwise execute, or backwards and have something that already executed run again. In Visual Studio, you can jump the point of execution by right clicking on a statement and choosing Set next statement from the context menu, or by pressing the Ctrl-Shift-F10 shortcut combination. In Code::Blocks, you can jump the point of execution via Debug menu > Set next statement, or by right clicking on a statement and choosing Set next statement from the context menu. Code::Blocks doesn’t have a keyboard shortcut for this command. First, run to cursor to line 11. At this point, you should see the value of 5 in the console output window. Now, right click on line 12, and choose set next statement. This causes line 11 to be skipped and not execute. Then choose continue to finish executing your program. We can see that printValue(6) was skipped. This functionality can be useful in several contexts. In our exploration of basic debugging techniques, we discussed commenting out a function as a way to determine whether that function had a role in causing an issue. This requires modifying our code, and remembering to uncomment the function later. In the debugger, there’s no direct way to skip a function, so if you decide you want to do this, using set next statement to jump over a function call is the easiest way to do so. Jumping backwards can also be useful if we want to watch a function that just executed run again, so we can see what it is doing. The set next statement command will change the point of execution, but will not otherwise change the program state. Your variables will retain whatever values they had before the jump. As a result, jumping may cause your program to produce different values, results, or behaviors than it would otherwise. Use this capability judiciously (especially jumping backwards). You should not use set next statement to change the point of execution to a different function. This will result in undefined behavior, and likely a crash. You now learned the major ways that you can use an integrated debugger to watch and control how your program executes. While these commands can be useful for diagnosing code flow issues (e.g. to determine if certain functions are or aren’t being called), they are only a portion of the benefit that the integrated debugger brings to the table. In the next lesson, we’ll start exploring additional ways to examine your program’s state, for which you’ll need these commands as a prerequisite. Let’s go! "In Visual Studio, the continue command can be accessed while not debugging a program via Debug menu > Start Debugging, or by pressing the F5 shortcut key." This line is under the title of START, I noticed continue and start are accessed in the same way, but people which don't notice it can get a bit confused because of that. 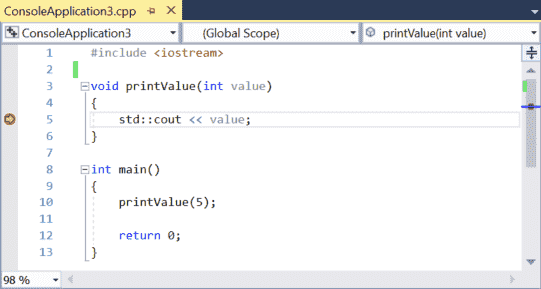 The same for the Code::Blocks line under the visual studio line. > Now, right click on line 13, and choose set next statement. This causes line 12 to be skipped and not execute. Then choose continue to finish executing your program. > We can see that printValue(6) was skipped. Isnt the output supposed to be 5? Isnt it supposed to be 5677? I've fixed a couple of line numbering typos, so I think the answers should be correct now. Yikes. Error fixed. Thanks for pointing that one out. "Note that breakpoints placed on lines that do not execute will not cause the debugger to halt execution of the code." 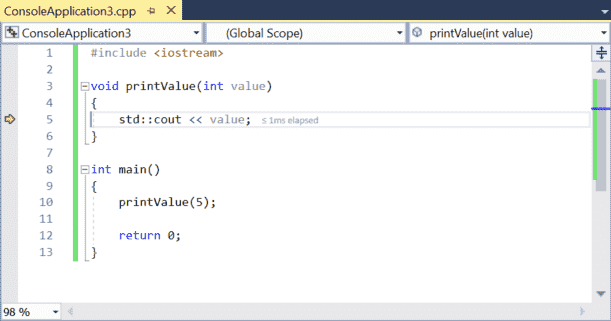 I could be misunderstanding something, but when I tried putting a breakpoint on the empty line 11 of your example code, Microsoft Visual Studio's default (I haven't messed with any setting of which I'm aware) behavior was to shift the break point to the next following line of code and halt it there. Does this update clarify things? "Note that breakpoints placed on lines that are not in the path of execution will not cause the debugger to halt execution of the code. ", or does it need further refinement? Ah, okay. So, for instance, if I place a breakpoint on line 18 (after EOF for int main()) then it won't halt execution. My understanding was that the compiler begins execution at the top of int main() and then proceeds through the code sequentially, but then why, if I put a breakpoint on an empty line above int main() and outside of a function, does it still halt execution at the start of int main()? The clarification does help a bit! Sorry for niggling over such a minor detail. Thanks for all your help! > So, for instance, if I place a breakpoint on line 18 (after EOF for int main()) then it won't halt execution. > why, if I put a breakpoint on an empty line above int main() and outside of a function, does it still halt execution at the start of int main()? It looks like Visual Studio temporarily relocates any breakpoints defined in the global scope to the start of the next function defined in the file.